Three Republican senators announced they'll oppose efforts to repeal the Affordable Care Act without a replacement. Senate Majority Leader Mitch McConnell announced Tuesday morning: "In the coming days, the Senate will take up and vote on a repeal of Obamacare combined with a stable, two-year transition period as we work toward patient-centered health care." But that latest health care effort by Senate Republicans lasted about 15 hours before it was effectively killed. McConnell announced late Monday night Republicans would look to repeal the Affordable Care Act first and then work on replacing it. That decision came shortly after Senate Republicans' latest bill to repeal and replace the Affordable Care Act stalled. But by midday Tuesday, three Republican senators — Shelley Moore Capito of West Virginia, Susan Collins of Maine and Lisa Murkowski of Alaska — said they wouldn't support that effort without a replacement. And that was one too many. McConnell could only afford to lose two Republican votes to move forward with a straight repeal of the Affordable Care Act. That was banking on a tie-breaking vote from Vice President Mike Pence. But even after three of his colleagues said they'd oppose a repeal, McConnell appeared to want to move forward with holding a vote. "We'll be doing that in the near future," McConnell said of the vote in a press conference Tuesday afternoon. A reporter said: "You don't appear currently to have the votes for that repeal plan, so if that vote fails, do you then begin working with Democrats?" McConnell replied: "Well, I think we'll have to see what happens. ... My suspicion is there will be hearings about the crisis that we have. We'll have to see what the way forward is." Senate Republicans passed a bill to repeal the Affordable Care Act in 2015. President Barack Obama ended up vetoing the legislation, and the House failed in its attempt to override the veto. Capito and Murkowski both voted for the repeal measure in 2015. 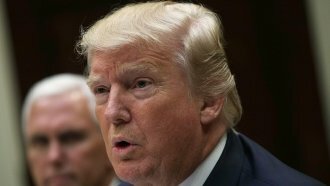 President Donald Trump said Tuesday he's "very disappointed" that efforts to repeal and replace the Affordable Care Act haven't gotten enough support. "We'll let Obamacare fail, and then the Democrats are going to come to us and they're going to say: 'How do we fix it? How do we fix it?' Or: 'How do we come up with a new plan?' So we'll see what happens," Trump said. Meanwhile, Senate Minority Leader Chuck Schumer called for Democrats and Republicans to work together. "The president's path, which is simply to sabotage the system and hurt millions and millions of people — make things far worse than they are today — is not an acceptable choice," Schumer said. House Minority Leader Nancy Pelosi also sent a letter to Speaker of the House Paul Ryan calling on Republicans to "pivot and work in a bipartisan fashion." She wrote: "Democrats extend the hand of friendship if Republicans will set aside repeal, abandon cuts to Medicaid, and abandon huge tax breaks for the wealthy." That's a tall order, especially since repeal and cuts to Medicaid were significant aspects of the House Republicans' bill, which did have enough support to pass the House. A group of 11 governors — both Republicans and Democrats — has called on the Senate to "immediately reject" repeal-only efforts.